The Elder Scrolls: Legends is a very different genre compared to previous Elder Scrolls games. This guide is intended to provide information on how to start playing the game on the right foot. For a detailed breakdown of what the icons mean on each card, check out the Card Breakdown page. Cards can be obtained in many ways: rewards for leveling up, rewards for finishing story mode battles, crafting them via Soul Summoning, and from card packs either won or bought. The player's avatar, or race, influences which cards they will collect most quickly. 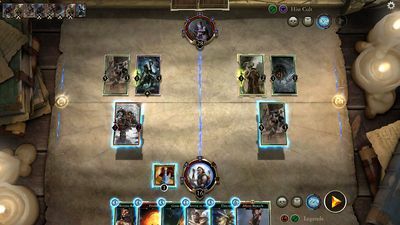 Card packs are available in Core Set and Heroes of Skyrim versions, which contain cards from those specific card sets. When opening packs, the lowest amount of rarities that can be found are 5 Commons and 1 Rare. In the most exceptional cases, there are packs that contain 6 Legendary cards. Decks can be constructed out of cards from up to two of the five attributes. The attributes chosen will determine the deck's class; each class has its own playstyle. Note that neutral cards can always be added to your deck, and will be the default type of deck if no regular attribute cards are added. For a list of pre-made decks that you can obtain and the rules for deckbuilding, check out the Decks page. In a battle, both will start with a set amount of health. Generally, battles begin with both sides at 30 health, though this is not always the case. At the start of the match, three cards will be drawn. If these cards are unfavorable, then any or all of the cards may be redrawn. The aim of the game is to use creature, action, item, and support cards to reduce your opponent's health to 0 or less before they do the same to you. Magicka is the currency used to play your cards. Every turn your magicka replenishes and is increased by one until the maximum of 12 is reached. Only certain cards like Tree Minder can increase your current and max magicka, while others like Brynjolf can increase it temporarily. Leftover magicka will not carry over to the next turn. In most games, the board is divided into two "lanes". Creatures can only attack other creatures within the same lane, or the other player. Typically the left lane has no special rules, while the right lane is a "shadow" lane: the other player's creatures cannot attack yours until after your next turn (although they can still be affected by actions). In some game modes the lanes may have different conditions or restrictions, such as boosting creatures' stats or preventing more powerful creatures from being summoned. There are five blue "runes" around each player's avatar. The first time a player is reduced to 25, 20, 15, 10, and 5 health, a rune will disappear, and a card is drawn from the top of their deck. If the card has the "Prophecy" keyword, they will be able to play it immediately during the other player's turn for free. Some cards also have abilities triggered by runes breaking. At the start of every match you can view the top three cards of your deck which will be your starting hand. You can select any cards you don't want to keep in your hand and they will be redrawn. You can not redraw the exact same you just selected, but this does not apply for other additional copies in your deck. As your deck is then reshuffled in a random order it can be possible to get a selected card as your first draw. This page was last modified on 7 April 2019, at 14:47.